A partnership between the VHC and Great Basin College’s Great Basin Indian Archives Program, the Shoshone Language Initiative offers Shoshone youth the chance to learn more about their language and culture while staying on a college campus.Image courtesy of Great Basin College. With NEH challenge grant funding that was used to raise an additional $1 million, Great Basin College established the Virtual Humanities Center (VHC), which provides in-person and online humanities access to an 86,000 square mile area in rural Nevada. The VHC provides live humanities programming to its communities. Recent events have included World War II film screenings with panel discussions by veterans; discussions about the Zika virus and vaccinations; and conversations about the Constitution and the blood quantum concept of Native American tribal membership. Distance communication technology purchased with grant funding makes it possible for the VHC to bring this programming to remote audiences, as well as broadcast humanities programming from other locations in the state. Audiences can enjoy lectures, panels, and performances from afar. The technological upgrades made to Great Basin College’s lecture halls have had additional benefits for the community—the halls are booked by outside groups who use them to do remote broadcasting. 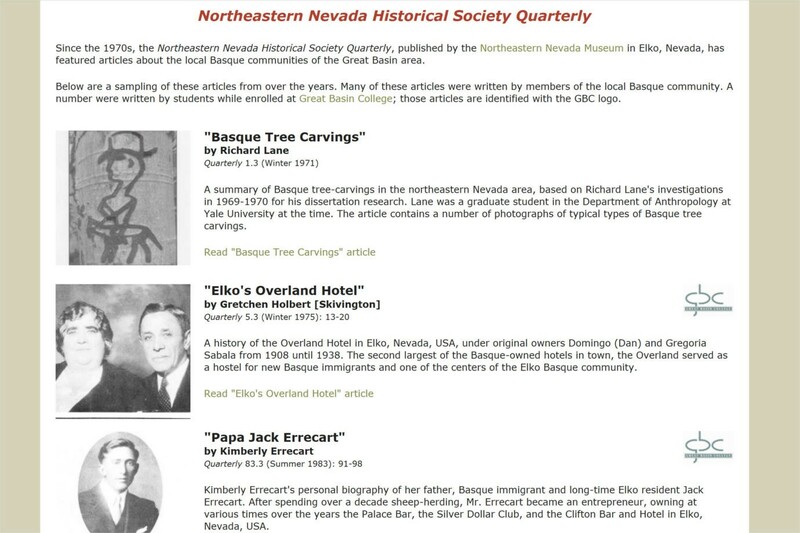 Archives of the Northeastern Nevada Historical Society Quarterly, which are hosted by Virtual Humanities Center. Image courtesy of Great Basin College. 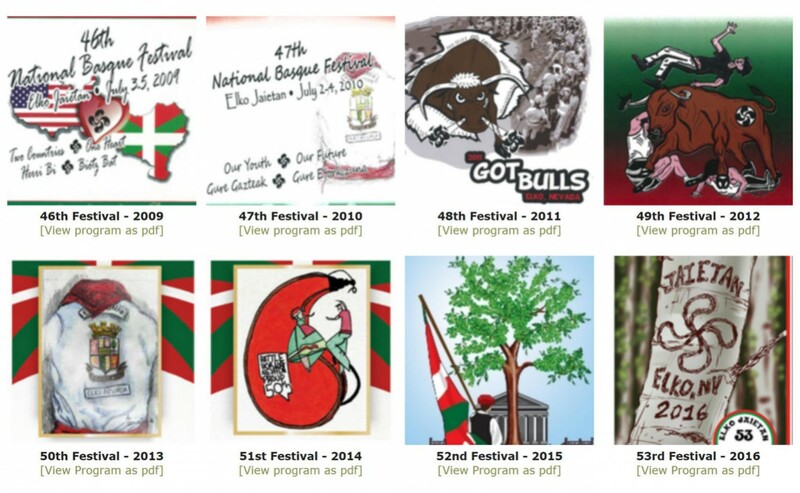 Basque Festival programs archived by the Virtual Humanities Center. Image courtesy of Great Basin College. 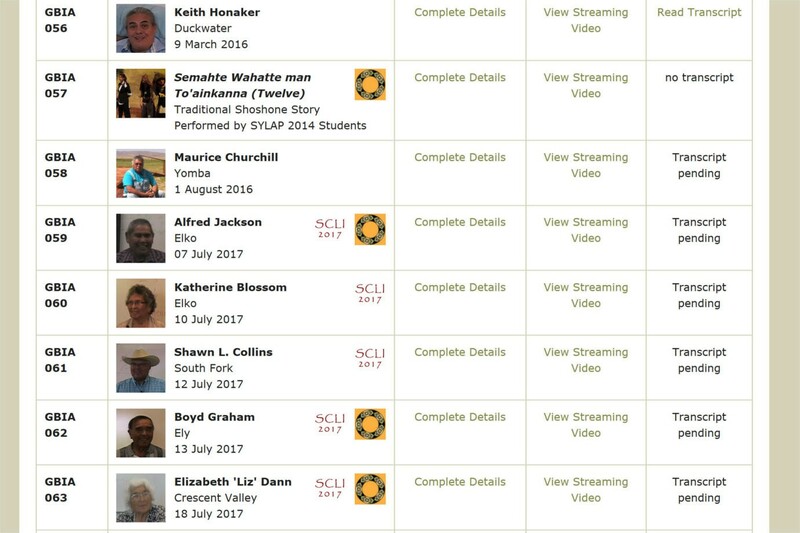 An archive of Shoshone Elders' oral histories, which are hosted by the Virtual Humanities Center. Image courtesy of Great Basin College. The Virtual Humanities Center is using its expertise in digital humanities archiving to build partnerships with organizations from across the state—and to host images, texts, and films. With the Great Basin Indian Archives, the VHC is collecting and hosting Western Shoshone Elder Oral Histories and supporting language revitalization with programs such as the Shoshone Community Language Initiative summer camp for high school students. With the Elko National Basque Festival, the VHC is cataloguing materials related to the region’s Basque heritage. It is working with the Western Folklife Center and the Northeastern Nevada Museum to catalogue additional materials representing Northern Nevada’s cultural heritage. Cumulatively, these projects make it possible for organizations and individuals to explore common areas of interest across many different communities and will allow the organizations to create shared digital exhibitions. With its mission to serve the immediate community and focus on local heritage and voices, the Virtual Humanities Center offers its community personally-relevant humanities content while providing much needed technological benefits to local groups. 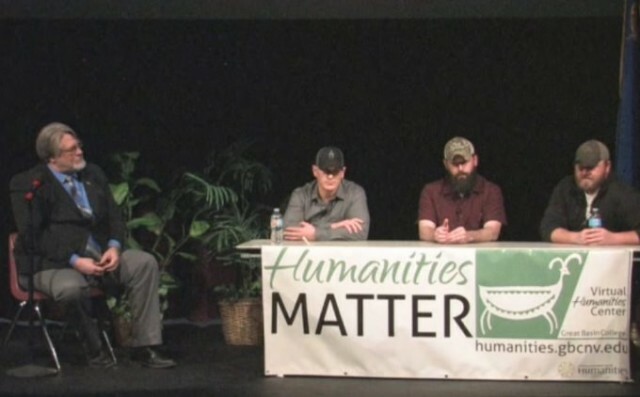 Veterans take part in a community discussion hosted by the Great Basin College Virtual Humanities Center. Image courtesy of Great Basin College.